Testing the manifold of a sand mound during construction. Onsite wastewater systems use a two-part process to treat wastewater (all the water used in your home) and then safely dispose of the effluent (treated wastewater) onto your property. Different types of systems use different processes and technologies to treat wastewater. The treatment process usually involves some, or all, of the following processes: the settling of solids (sedimentation), flotation of lighter materials (scum), anaerobic digestion (microorganisms break down organic material without air) and clarification, and sometimes also includes aeration and disinfection as further treatments. Wastewater treatment systems include septic tanks, biological filter systems, aerated wastewater treatment systems and composting toilets (wet and dry). Effluent disposal systems include evapotranspiration absorption beds, absorption trenches, subsurface irrigation and surface irrigation, and mound systems. Primary - minimal treatment involving flotation and settlement to separate solids and liquids, and disposal of the clarified but still contaminated effluent (such as septic tanks). Pump out tanks were installed in the past in areas where it was not possible to dispose of effluent safely on properties due to the location, soils etc. But pump out tanks are no longer an option for new dwellings with more advanced wastewater systems now available. Secondary - more advanced treatment using air (aerobic) and biological processes to decompose the solids and chlorine to disinfect so it is suitable for irrigation (such as aerated wastewater treatment systems). Tertiary - highly advanced systems that use air and biological processes as well as membranes and UV (ultra violet) disinfection to treat wastewater to a very high standard (such as advanced aerated wastewater treatment systems). If you have purchased a property with an existing onsite wastewater system, you need to identify the type of treatment and effluent disposal processes your system uses, so you can learn how to manage and maintain the system. 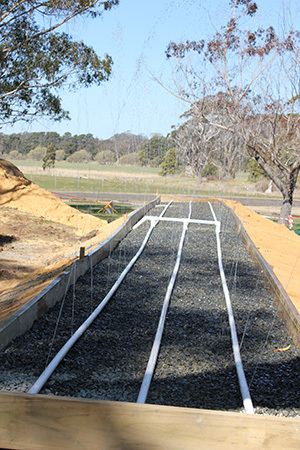 If you are planning to install a new onsite wastewater system, refer to development application process in the Sydney drinking water catchment.